A Paul Gauguin painting displayed for the first time in 15 years failed to sell at a London auction on Wednesday. Nature Morte A L'Esperance had been expected to fetch up to £10 million at the Christie's sale. Yet no buyer could be found for the piece, painted by the French artist in Tahiti in 1901. 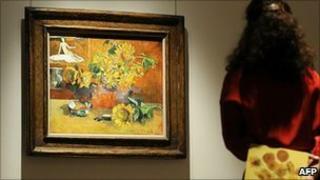 Other works were sold in the Impressionist, Modern Art and Art of the Surreal sale, raising a total of £84.8 million. One piece, Pierre Bonnard's Terrasse a Vernon, fetched £7.2 million - a world record for the French painter. A Degas painting of two young ballet dancers was bought for £5.42 million, while a 1901 painting by Picasso went for £3 million as expected. Nature Morte A L'Esperance is believed to be a tribute to Gauguin 's volatile friendship with Vincent Van Gogh, with whom he lived in 1888. A recent exhibition of Gauguin's work at London's Tate Modern featured more than 100 works of art by the celebrated post-Impressionist.